Alright, here's my second attempt at making a "cool" looking Necron scarab swarm. I took all the feedback I got from the first scarab post along with the lessons I learned in making the first one and came up with this. I'd like to thank Khepri's Eternal Legion for sending me one of their cool bases for me to put my new attempt on top of although I'm afraid I covered it up completely in my effort to get a good "carpet" look to my swarm. You can see what the bases look like here when they aren't completely covered. I'll be going over these particular bases in another post soon. Now before I go any further, let me make a couple things very clear to those folks thinking they are going to grab a few supplies and start making their own scarabs without any trouble at all. 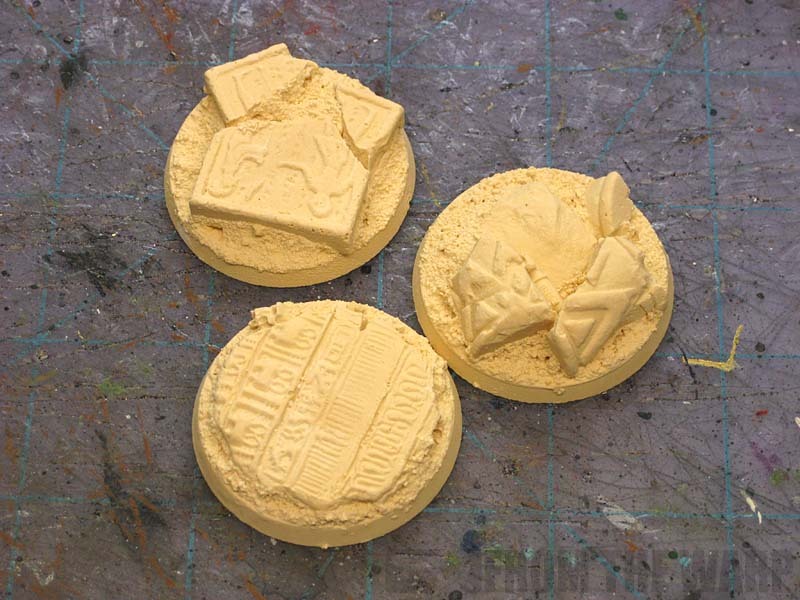 The idea with this post is not to create a "how to cast" pieces from GW so you don't have to buy them yourself. The idea is to show you the amount of work that goes into getting a tiny result like this and it's not as simple as everyone might say on the internet. You don't just make a mold and then "pop them out by the handful." You will not save money in the long run casting a few bits here and there. What it does is allow you some flexibility... but it comes at a cost. The work that goes into it far exceeds what you get out of it... unless you start selling the stuff and that's completely illegal I'm sure. There are two things to keep in mind before you think you're going to do this and save yourself tons-o-money. 1. This is not a quick process. 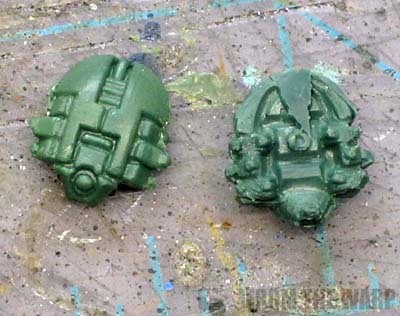 It takes time to make each individual scarab (2 hours for the greenstuff to set and then another 3 hours or so for it to fully cure) on top of the time it takes to make the molds and that doesn't count the time required to clean them up once they are cast. Quick is not the word I would use to describe this. Very, very time consuming is more like it. If I played Necrons and built a squad like this. I would use it in every single game I played after that. With the amount of work I have involved, the unit would never, ever come out of my list. I'm trying to figure out how to include these guys in my Deathwing army since I have so much time invested in them already. 2. This is not cheap. While it may seem like a quick fix to get what you want without having to buy it, the reality is much different. It seems like a great idea at first, cast up some scarabs so I don't have to buy them... great! And then reality hits. I know I've mentioned it before and it's worth repeating. You're probably better off just buying the bits you need or even better yet, swapping with friends to get what you need than trying this route. You're going to pay one way or another. If it's not money up front, it will be in time, effort and energy put into the project. There comes a point when it's just simpler to buy what you need sometimes. And don't forget, not all of your cast attempts will come out "correct." Think of those as money you just throw away. I actually did a little looking online and it really is a tiny bit cheaper to buy the scarabs than it is to try and make them yourself (at least at the point of this being posted). I spent some time hunting them down, but it is cheaper. Unless of course you're making something like ten thousand of the little things and then I'm sure the cost swings the other way. So let's get to it then. 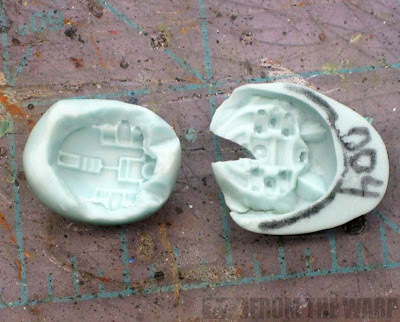 When I first made my mold of a scarab, I had the mold line running down the middle of the back. This was so I could get the detail of the legs. If you look at the picture there, the left hand side shows you the trouble area. It's the undercut portion of the model. What's makes it more troublesome is that it is an important part of the model as it defines the shape of their legs. You can't just make a simple press mold of the top of the guy and call it a day. You need the detail on the bottom there to give them the correct shape. You can see where GW set their mold line to be able to get the detail on theirs. Why and how is not important as they have lots of equipment and make decisions based on a number of things we don't have to worry about. As far as we are concerned, it's about getting the most detail possible so that we can create a cool looking model in the end. Remember when I said this would be work? Here's where it starts. We're moved past the one piece press mold now into multiple piece press molds. Lots of new things to consider. Just like the shoulderpad I tried to do, it requires lots of practice, a good bit of experimenting and a little bit of luck to get it come out right. When I first made my two part press mold, I split the scarab in half down the middle so I could get the detail on the undersides of the legs. It works, but it leaves the mold line across the top of their backs in a place that we don't really want. The solution is to move the mold line. Instead of doing the two part mold and splitting the model in half vertically, I decided to split it horizontally. Of course this creates a number of other problems as well. Yes, it moves the mold line off the back of the model, but it wraps it all the way around the outside now. In the end, we are still making a press mold that we are going to push greenstuff into, it's just in two parts now and not one. All of this to allow us to get the detail we need. And here's what we have. A Necron scarab with no mold line on top, but with one that runs around the outer edge. He's still not something we are going to jump up and down about and start selling online tomorrow, but he'll do in mass as long as there are a few real ones set on top to be convincing. I started the second one with my cool base, 16 scarabs and the idea that I was going to make a moving carpet of these guys. I tried to make them look like they are floating over each other by adding small blobs of greenstuff under each one to give them some height. I also moved them up off the ground as well. By positioning them at slightly different angles to each other, I tried to reinforce the feel that they were moving along at a good speed. One of the requests from the last one was to make the little eyes on the front look like they were glowing. As if this project wasn't enough work already. That meant 16 little examples of OSL. Not terribly difficult, but time consuming. 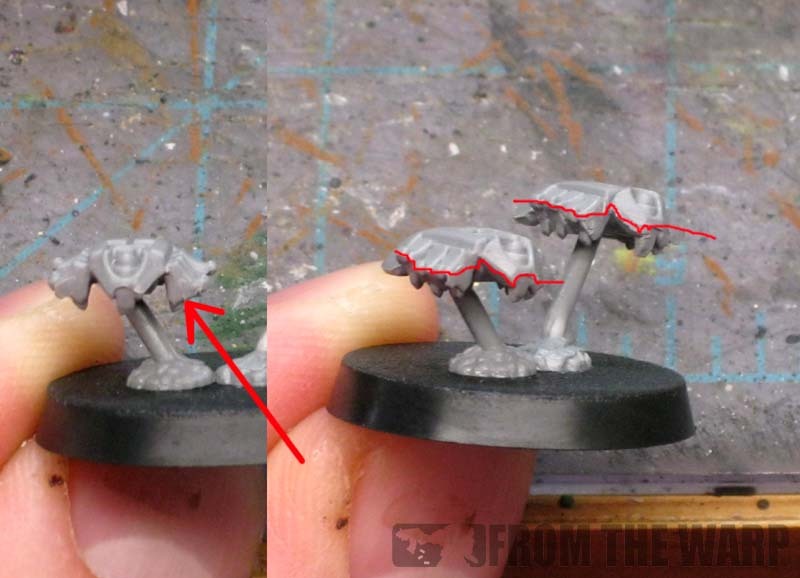 I cheated and did a real simple OSL effect. I started with GW Snot Green slightly thinned down, I painted that over the eye and immediate surrounding area. Once that dried, I took a light green color (Fresh Foliage from Folk Art paints) and painted the eye itself. Then it was a quick wash with GW Thraka Green over the whole eye area to tie it all together. The final step was to add a tiny dot of the light green color over the very top portion of the eye itself. For gaming level work, this is more than enough. If you were looking for more, it might take some additional blending and such to get the best effect. And a look at how the new one stacks up against a regular model. I'd say this second attempt is a pretty good improvement from my first. 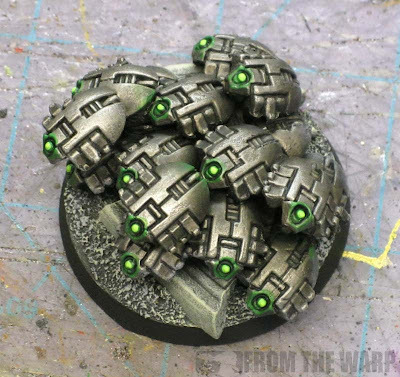 The OSL really adds to the look of the swarm and is worth the time it takes to do it for 16 little eyes. This is more like how I imagine they should look on the table. 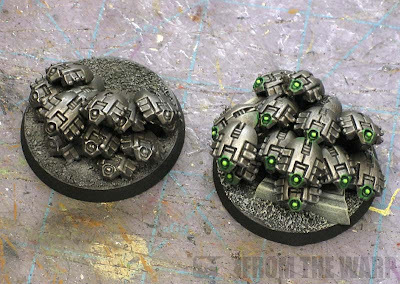 I did have one reader, Eye of Error, send me some pics of the Necron scarab bases ha made for his force. He used less of the scarabs and incorporated a bit more story into them by adding bits and pieces of machinery. I think this gives the models a great look and also helps cut down on the sheer amount of these guys you'd need to make. It really helps tie them into the base and gives a bit of a story to them. I want to say thanks to everyone who commented and emailed me with tips and suggestions after the first post went up. I'd considered the project done after the first base, but you all had some killer ideas that I couldn't pass up. You've hit the nail on the head now Ron! Your first attempt was a great demonstration of the concept but I really think the latest version is excellent. 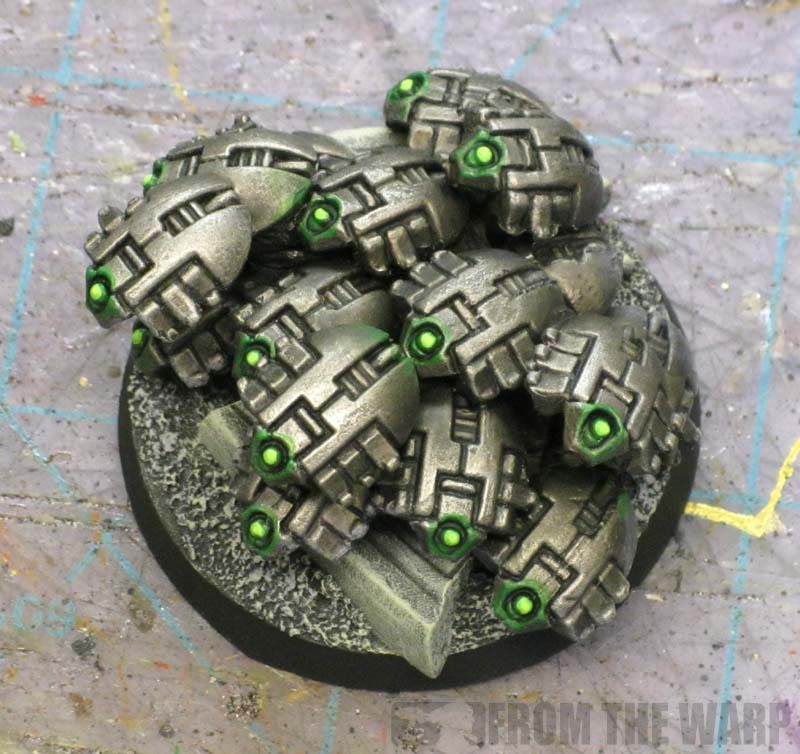 Although more time consuming the glowing "eyes" really make the model stand out and the arrangement gives the impression of a genuine swarm. this is like silicon , but it gets soft with heat and gets solid again when it gets cold,and reusable . you can blend sticks of oyamaru together, cut it and blend it again later. Yet more great work, Ron. I'm trying to fight the urge to try this out, but I fear I may be losing. 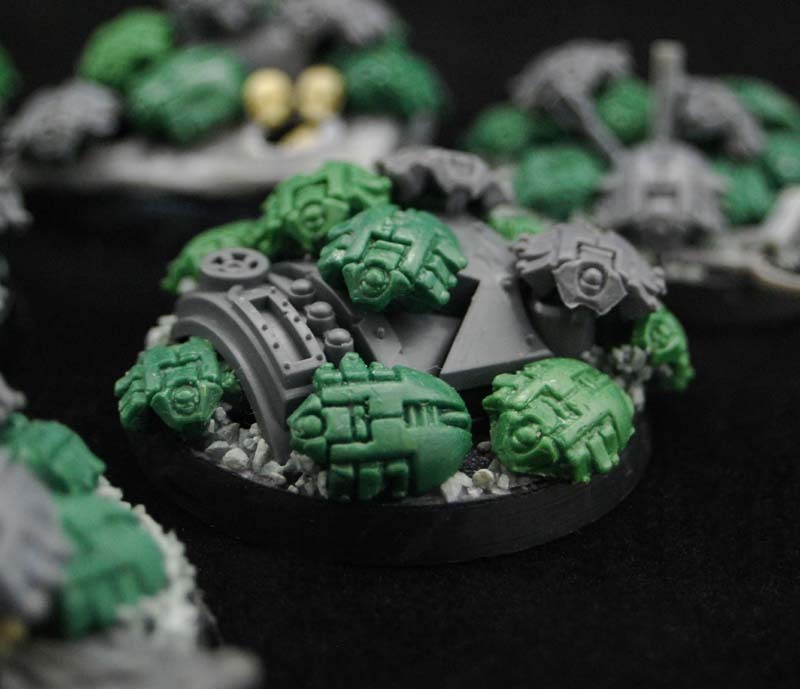 Non-uniform Scarab bases has a massive appeal. Anon: For where I'm at, it's still a bit cheaper to skip the whole casting thing and buy them. There are lots of ways to do this. Casting is not cheap in the end and unless you cast everything you get your hands on (which there really isn't a need to do I think) you are spending a good amount of money for one thing in the end. Wow! Truely amazing, i will copy this motion for motion! Ron, you do make a good point. Casting does take a lot of time and effort for something like this. And to be honest, I would much more prefer grabbing this type of stuff from a bitz site and spending the money, because in the long run it is cheaper. The scheme looks great! I am just starting into trying my hand at doing some OSL on different models, thanks for some simple tips on moving forward with that. I just have to mention one thing, has anyone seen the outrageous prices scarabs are going for on ebay now? I saw a set of 8 scarabs going for like $15 the other day. Casting is def the way to go with everyone spamming this unit option and bits stores selling out rapidly. When I did mine, I made a mold with about 20 scarabs in it. It only took about 3 casting sessions to pop off everything I needed for 10 bases. Wow, this new base looks great! That's pretty much how I would do mine. Great article and very well done, though I don't agree that casting scarabs isn't cheaper than buying them. It all depends on the method and how you are doing it. Push molds with green stuff isn't the most efficient way to do this. 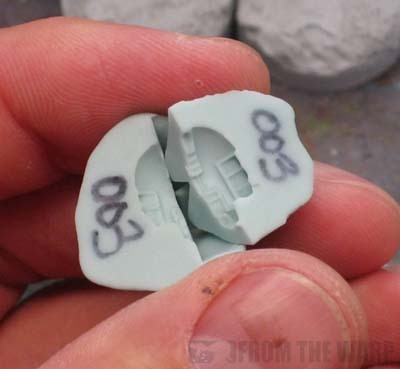 The casting time would go a lot quicker if you created a proper 2 part mold and and went with something like Smooth-Cast 300. Also, you don't need to limit yourself to casting 1 at a time. When I do this, I plan on making a mold that will do at least 6 at a time. There is a lot of info on casting at: http://www.smooth-on.com I'd recommend their Pourable Silicone Starter Kit for those that are looking to get started. Don't misunderstand me, I'm not knocking this article at all, but there are ways to make this more cost effective and less time consuming. Fayte: And that's the biggest thing out of all of this. It takes time. The OSL stuff should get you started or at least give you the understanding to work from on your own models. LuckyNo.5: I didn't realize they were so popular in the new codex. I don't have it and I just wanted to build something cool looking. And you're right, there are ways to improve this process... but creating a silicone two part mold of multiple scarab models is a bit more advanced than making a simple press mold for greenstuff. It may be more efficient, but it gets to the point where you may be spending a good bit of money and time for three bases of models in the end. It's a balance each person will have to find on their own based on what they want to build. Da Warboss: The idea of motion is a little tough to get across. In the end, I'd need to make sure I had enough of a different look to each one if I were doing multiple bases. That would definitely be one thing to consider if you were doing this for an army and had a handful of bases you needed to make. This base definitely screams swarm. Much much better then your first attempt but hey it was your first attempt after all. I may be able to use this idea in the near future. Let me congratulate you Ron, is interesting to see how you managed to do the molds, I also think that casting might seem as an easy way out but in fact I think that when not properly planed will in fact take more in energy and time that the free part some people think is the main atractive of it. as always excellent tutorial a opinion witha great model base to booth. Ron, Sorry for commenting so late on this thread, but I only just started playing 40K, and a Necron army , so I've been looking for ways to get lots of scarabs, and your two posts inspired me. Personally, I chose a slightly different route. I initially opted for the two-part mold with Green Stuff, but you're right, it takes forever. In the end, I instead went with Amazing Mold Putty (from Alumilite Corp.) for the mold, and their Amazing Casting Resin as the medium of choice. I opted for a single side mold, but the great thing about the putty is when you make the mold, you can wrap it around the legs as well, and it remains extremely flexible, and very easy to pop the casted items out once they set. I made a mold with 6 scarabs in it to speed up the process, and I've already churned out 36 in about 3 hours tonight! Regardless, thanks for the inspiration! 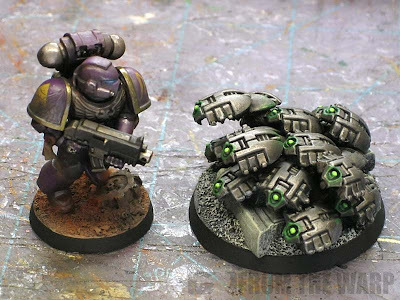 Brian: Glad to hear that you've been able to come up with a solution for your Necron force. There are lots of ways to solve this puzzle and I'm glad you've found one that works for your needs. Sounds like you're well on your way to building a huge swarm.